combined. Let the batter stand at room temp for one hour or chilled overnight. the pancakes for 2 min on each side, or until they are golden and cooked through. Serve with syrup. Whisk the first set of ingredients together and voila, your sauce. Set aside while you make the pancakes. In a large mixing bowl, whisk eggs with the soy sauce, sesame oil, and salt. Gradually add the flour until incorporated. Fold in cabbage, scallions, and shrimp. 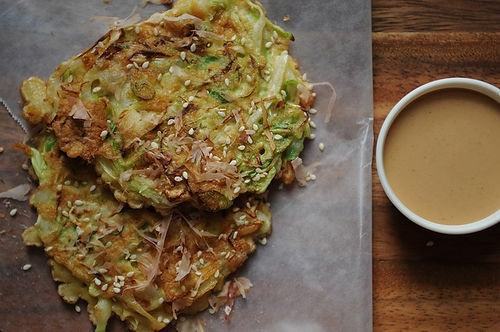 The large cabbage pancakes known as okonomiyaki are often referred to as “Japanese pizza.” As the name — literally “as you like it, grilled” — implies, they are versatile. You can embellish the batter with whatever you want, such as seafood, sausage, chicken or other vegetables. 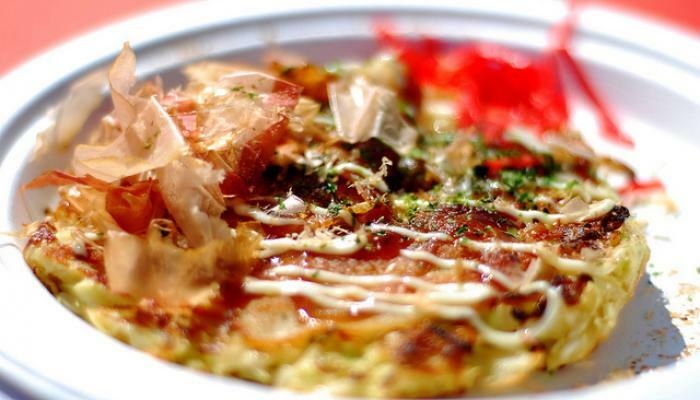 Okonomiyaki can be eaten at any time of day; make them with bacon and top them with fried eggs for breakfast. Usually drizzled on top of okonomiyaki are okonomi sauce or tonkatsu sauce (think Worcestershire sauce, soy sauce and ketchup mixed together) and Kewpie brand mayonnaise, which is slightly sweet because it’s made with seasoned rice vinegar. (Think Miracle Whip.) Feel free to be creative with the sauces. An optional recipe for wasabi mayonnaise, great on seafood dishes, is included; see Notes. Using squeeze bottles will allow you to make cross-hatch patterns with those garnishes. Other okonomiyaki garnishes include chopped scallions, bonito flakes (for seafood dishes) and aonori (seaweed flakes, used as you would chopped parsley). Nori fumi furikake, a blend of sesame seeds, seaweed, sugar and salt used for flavoring sushi rice, also makes a delicious garnish. See the variations below. Crunchy bits of tempura batter (tenkasu) are added to the cabbage batter for texture. You can buy them in packets at a Japanese market (they resemble Rice Krispies), but making your own yields a better result, even though it means extra work and mess. Using white cabbage coleslaw mix, even one mixed with carrots and red cabbage, is a huge time saver. Instant dashi may be substituted for the dashi broth in this recipe. Follow the directions on the packets if using them, or dissolve instant dashi, such as Hondashi brand, in boiling water at a ratio of 1 teaspoon of granules per cup of water. All of the aforementioned ingredients, sometimes including okonomiyaki kits, are available at Hana Japanese Market in the District and at Super H Mart and H Mart stores in Virginia and Maryland. Make Ahead: The batter can be made and refrigerated a day in advance. It’s best to assemble the cabbage mixture and the pancakes just before serving. The optional wasabi mayonnaise needs to be refrigerated for at least 4 hours before serving. Whisk together the flour and 1/2 teaspoon of salt in a medium bowl. Whisk in the dashi and egg until the batter is combined, but do not overmix. Small lumps should remain. The total yield is about 1 1/2 cups. For each pancake, mix together 2 cups of cabbage, 1/2 cup tempura bits, 1/2 cup of the scallions and one-fourth of the batter in a separate bowl until well combined. Heat a teaspoon of the oil in a 12-inch nonstick skillet over medium-high heat until the oil shimmers. Pile in the pancake mixture and use the side of a spatula to tap it into a 10-inch round about 1/2-inch thick. Let the pancake cook for about 3 minutes, or until the batter is set and the bottom is nicely browned. Use two spatulas to carefully turn over the pancake, keeping it in one piece. Cook for about 3 minutes, until it is cooked through. Transfer to a plate; drizzle with okonomi or tonkatsu sauce; wasabi mayonnaise, Kewpie mayonnaise or Kewpie-style mayonnaise; and aonori or nori fumi furikake. Repeat the process with the remaining oil and pancake mixture to form and cook 3 other pancakes, garnishing as each one is done. Serve right away. To make one seafood okonomiyaki, add to 1 serving of the pancake-cabbage mixture: 3 ounces of shrimp or sea scallops, cut into 1/2-inch pieces, and 2 teaspoons chopped pickled ginger. Cook as directed above. Serve hot, topped with 2 teaspoons okonomi sauce, 2 teaspoons of Kewpie mayonnaise and bonito flakes (to taste). To make one smoked salmon okonomiyaki pancake, cook the pancake as directed above, covering the finished pancake with 3 ounces of sliced smoked salmon then topping it with 2 teaspoons of wasabi mayonnaise, 2 tablespoons of slivered red onion, 1 tablespoon of peeled, seeded cucumber cut into 1/4-inch cubes and aonori or nori fumi furikake (to taste). To make one margherita okonomiyaki pancake, preheat the broiler. Thinly slice 3 basil leaves and add to the pancake-cabbage mixture. Cook as directed above, making sure to use an ovenproof skillet. Top with 3 ounces of sliced fresh mozzarella, then broil for 1 minute to melt the cheese. Transfer the pancake to a plate. Serve hot, garnished with 1 teaspoon’s worth of tomato paste from a tube, squeezed in a few squiggles, and 3 additional basil leaves, thinly sliced. To make one egg-and-baconomiyaki, fry two eggs (sunny-side up or over-easy or poached) in a small nonstick skillet; keep warm. Pile the pancake-cabbage mixture into a 10-inch round in separate 12-inch skillet as directed above. Lay 2 strips of bacon on top, using them to cover as much of the surface as possible. Once the bottom is nicely browned, flip the pancake over. Cook for 3 to 4 minutes, until the bacon is nicely browned. Serve hot, topped with the fried eggs, nori fumi furikake and chopped scallions. Notes: To make wasabi mayonnaise, whisk together 1/2 cup mayonnaise and 1 tablespoon of wasabi powder in a medium bowl. Cover and refrigerate for at least 4 hours and up to 3 days. To make Kewpie-style mayonnaise, whisk together 1/2 cup of mayonnaise and 1 tablespoon of seasoned rice vinegar. Cover and refrigerate for up to 3 days. Mix all dry ingredients in one bowl and wet ingredients in another. Add wet to dry and mix well (batter will be thin). Let sit for at least fifteen minutes so the oatmeal softens. 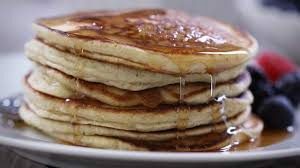 Melt half a tablespoon of butter (or just spray with Pam) in a preheated skillet (preferably cast iron); add 1/4 cup of batter for each pancake. Grill until brown on one side, flip and grill until second side is brown. Serve with butter and syrup!